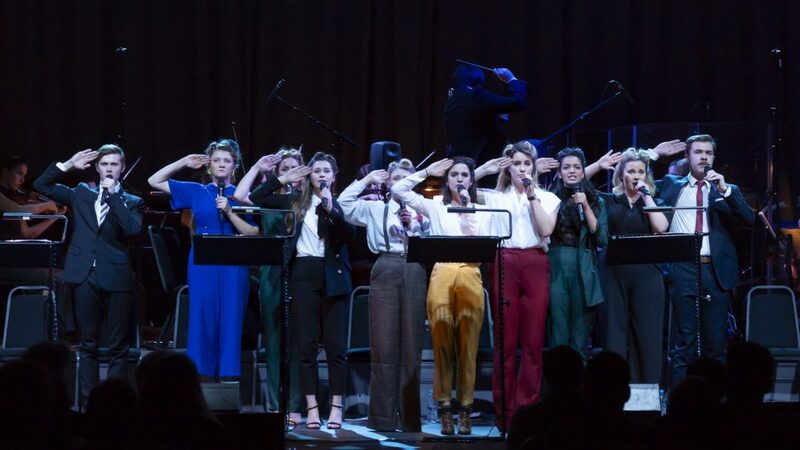 The Live Concert Recording of Girlfriends, by Emmy Award-winner Howard Goodall and recorded at Bishopsgate Institute, has just been released. The album is the world-premiere recording of Howard Goodall’s spectacular Second World War epic, and is also the debut album of the London Musical Theatre Orchestra. The album features an all-star cast, led by Lucie Jones as Lou (Legally Blonde, UK Eurovision Entrant 2017, Les Misérables) and Lauren Samuels as Amy (Bend It Like Beckham, Romantics Anonymous, We Will Rock You). They are joined by Bronté Barbé as Jane (Beautiful / Shrek UK Tour), Natasha Barnes as Sally (Funny Girl / Mack & Mabel), Vikki Stone as Jasmine (The Now Show / Lyric Hammersmith’s Aladdin and Jack & The Beanstalk) and Rob Houchen as Guy (Candide / Les Misérables). The cast is completed by Chris McGuigan, Lizzie Wofford, Lisa Bridge, Charlotte Clitherow, and Tara Divina. The 2018 concert was directed by Bronagh Lagan. The album features new orchestrations by Simon Nathan and the composer. The London Musical Theatre Orchestra was conducted by Freddie Tapner and led by Debs White, and the album is produced and edited by Howard Goodall and mixed by Gary Thomas. Critics called the 2018 concert “a truly triumphant performance” (★★★★★, Theatre Weekly), “sumptuous” (★★★★★, LondonTheatre1), and “seriously gorgeous – as close to musical ecstasy as it’s possible to get” (Mark Shenton). The album can be downloaded on all platforms here. Hard copies of the album can be ordered here.